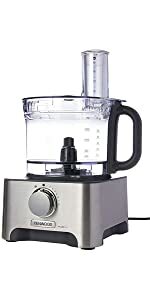 Kenwood FPM910 Multipro Excel food processor features a 935-watt turbocharged motor can tackle food processing with ease. 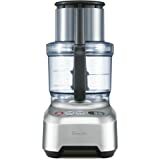 The patented tri-drive system and variable speed control provide the professionally inspired versatility. 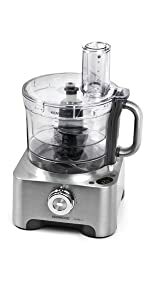 Comes with 4 litres capacity bowl with 2 litres working bowl liquid capacity. A simple, intuitive dial features 8 speeds plus pulse. 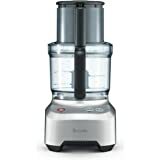 The revolutionary auto sense function automatically regulates speed for optimal food preparation. The Tritan 16-cup bowl is shatterproof, BPA free, odor resistant and dishwasher safe. The extra-wide feed tube accommodates whole onions and potatoes. 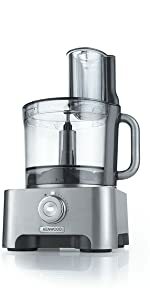 The integrated scale to easily weight out ingredients for healthy living and portion control. Specifically designed Kenwood storage box is to easily store attachments. 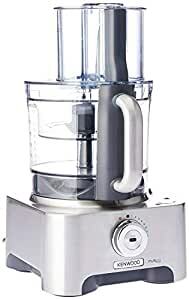 The package includes a shatterproof food processor bowl and mini bowl, a thermo resist blender, 5 food processor discs and built-in weighing scales. 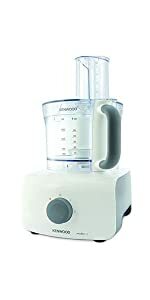 The Kenwood Multipro Excel FPM910 is Kenwood’s largest food processor and comes with a wide range of features to match, including a shatterproof food processor bowl and mini bowl, a thermo-resistant blender, citrus press, 5 food processor discs and built in weighing scales. The Multipro Excel’s generous TritanTM 4L Bowl and 1.6L Mini Bowl are shatterproof, BPA free and remain crystal clear, even after dish-washing. 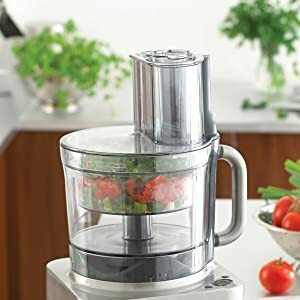 The ThermoResist Blender can blend hot soups and cold smoothies without damaging the glass and the glass Multi Mill attachment is perfect for grinding spices and chopping herbs. In addition, you can quickly and easily make fresh orange and lemon juice for breakfast or for cooking with the Citrus Press attachment. 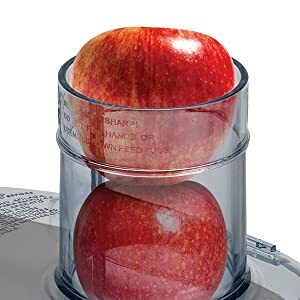 The Excel’s extra wide XXL Feed Tube, large enough to fit a whole apple, means you don’t need to prepare most foods in advance and the built in weighing scales allow you to measure ingredients straight into the bowl with less mess. 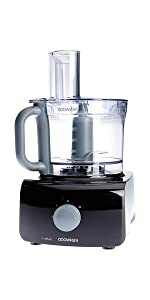 The powerful 1300W motor drives Kenwood’s Total System, meaning the food processor, the thermal shock resistant blender and the glass compact chopper attachment all work from a single drive, saving valuable space in the kitchen. 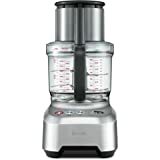 The Variable Speed setting offers 8 Speeds + pulse, for perfect results, and the intelligent Auto Speed function can be used when you’re unsure which speed is best. 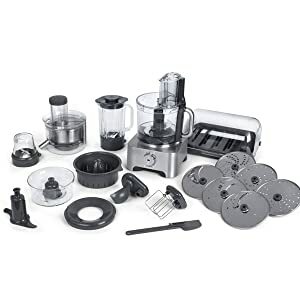 Dough Tool, Whisk, Spatula, Thick Slicing and Fine Slicing Disc,s Knife Blade, Rasping Disc, Citrus Press, Mill, Mini Knife Blade, Mini Bowl, Chopping blade, Folding Tool, Crinkle Cut Disc. Save time with this extra wide feed tube, large enough to fit a whole apple, meaning that less food has to be prepared beforehand. 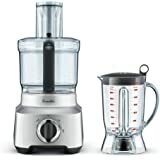 Multipro Excel is the first food processor to use revolutionary TritanTM plastic for its shatterproof 4L main bowl and 1.6L mini bowl. They won’t absorb flavours or colours and will retain it’s lustre and shine even after repetitive dish-washing. 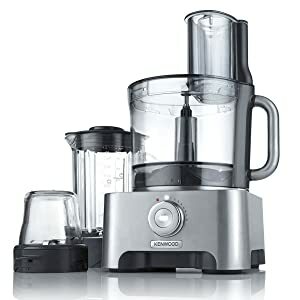 The ultra-tough glass of the ThermoResist Blender attachment, allows for both hot and cold blending without the risk of the material cracking or shattering. 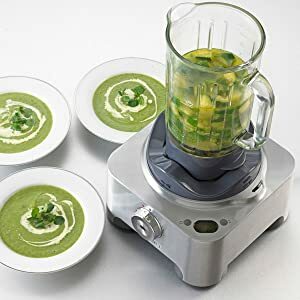 This is a fantastic added feature that will help you preparing creamy soups and sauces without having to wait until the pre-cooked ingredients will cool down. 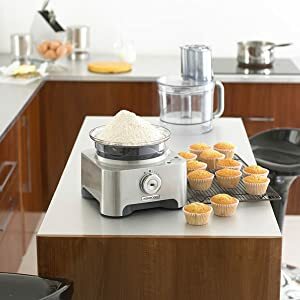 Built in Scales and a handy tare (zero) button will save you valuable time and add extra precision by allowing ingredients to be weighed directly into the bowl. You can't get it wrong, take full advantage of Multipro's potential! 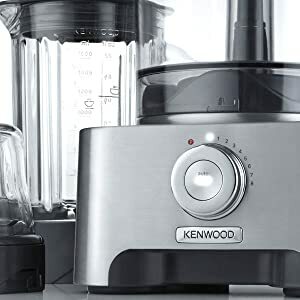 Powered by a 1300W motor, this Kenwood food processor delivers the optimum speed and performance needed for food blending and preparation needs. The variable speed setting offers 8 speeds + pulse to give you total control over the task in hand. If you are unsure which variable speed setting to use, the auto speed function will select the maximum speed for you. The Multipro Excel will automatically switch to Eco Mode if left idle for 30 minutes. 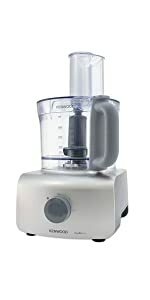 Kenwood Multipro Excel's attachments have been developed to deliver quality, consistent results time after time. The Folding Tool attachment is designed to expertly fold fruit fools, meringue and mousse. Innovative and intuitive, the Folding Tool recreates this classic baking technique to produce fine cakes and desserts. Whatever your culinary creation is, this folding tool is an essential utensil in food preparation.